Land the Internship? Are you Ready to Make the Most of It? Internships are important. You know that by now. An internship provides you the opportunity to develop valuable skills, build your resume, gain experience, grow your network, explore industries and hopefully earn some money. While you might be tired everyone telling you to find an internship, the reality is internships are valuable and necessary. Perhaps more essential than you initially thought. Your summer internship may, in fact, be a bit of an extended job interview. In 2017 The National Association of Colleges and Employers (NACE) reported that 75% of employers with internship programs indicated the primary focus of these programs was to recruit college graduates for full-time, entry-level positions. LinkedIn provided some interesting data about the companies utilizing internships as a recruitment tool and their respective conversion rates into employment. So it’s not a given that your internship will land you a full-time job with the same company but with so many top employers converting interns into employees it definitely suggests you enter your internship prepared to nail it. So how do you go into your internship ready to slay it? Cue the Denison Internship Program is also known as DIP. DIP provides you a “structured learning experience as you explore the career field and apply academic coursework in the workplace.” Basically, we are going to help you head into your internship with goals, review your progress during the internship, and help you reflect after your internship to ensure you can articulate just how the internship impacted your career journey. PS – if you haven’t landed your internship yet then come see us! The Knowlton Center offers multiple resources to help you. 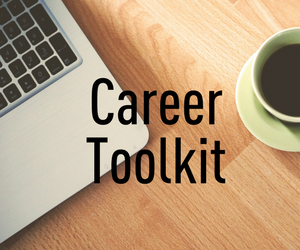 Have you checked out our Career Toolkit to learn the basics and get started? Try attending one of our Career Labs for a more in-depth look at career topics such as “Landing Your Internship”–a topic so important we named a Lab after it! Finally, work 1-1 with our coaches and peer advisors to be ready to act when the opportunity presents itself. My name is Gabriella Caldwell, I am a Junior double majoring Black Studies and Communications. My internship at the Denison Archives and Special Collection was amazing! I never thought I would learn as much as I did in the short amount of time I had. Through managing a project alone, visiting other depositories, researching archival job postings, and setting up three different displays; I have gained more confidence working alone, asking questions and became more confident in my abilities to problem solve. I’m excited to continue to explore the Archives next semester and expand my knowledge of the field even more than I already have. “Denison’s Department of Theatre made significant contributions to the surrounding Denison community, as well as to the larger theatrical community. Summer and Children’s Theatre programs allowed for the surrounding community to enjoy and engage with the arts, and actors/actresses such as Hal and Ruby Holbrook, Henry Sutton, Bill Moore, Steve Carrell, Jennifer Garner and many more gave the acting community iconic actors and actresses. However, as with many things, Denison’s Department of Theatre is more than just examples of exceptionalism. Seeing the Afro-American Museum archives gave me a better understanding about the kinds of collections I want to work with in the future, it also gave me a better understanding of what graduate programs look like for archival work. And taking the StrengthsFinder test really opened my eyes to some skills I was not aware I had, and gave me the tools to improve in areas I struggle with, as well as the language to use to promote my skills. This summer has been extremely helpful while I continue to think about what I want to do with my life. I am very thankful for the opportunity to work with Sasha and Colleen and look forward to continuing my work with them in the future. Africa Division of Human Rights Watch, Washington, D.C.
My name is Imaa Nicco-Annan and I am a senior at Denison University majoring in International Studies with a concentration on human rights and women empowerment, and a minor in French. This summer I had the privilege of working in the Africa Division of Human Rights Watch (HRW) in Washington, DC. Human Rights Watch is a renowned, American-founded international non-governmental organization that conducts research and advocacy on human rights. The organization is known for its neutral reporting, accurate fact-finding, effective use of media, and targeted advocacy. This is often in collaboration with local human rights groups. Human Rights Watch also publishes more than 100 reports and briefings on human rights conditions in some 90 countries, generating extensive coverage in local and international media, some of which we, as interns, had the privilege of drafting. My responsibilities as the Africa Division Intern were to draft reports and documents regarding issues in Africa while interacting with other US and international organizations, and foreign and domestic government officials. A typical day of work involved monitoring the media for human rights issues occurring in select countries in West Africa; namely Senegal, Guinea, Cote d’Ivoire, Mali and Gambia. My colleagues and I were assigned typical intern tasks such as filing and scanning documents, attending external meetings, flagging and sending emails regarding important press releases. However, we were also given a lot of leeway to work on tasks that were more geared towards our personal interests. Human Rights Watch organized weekly “Speaker Series” where professionals within the organization would speak on varying issues which helped broaden my knowledge about the gravity of some human rights issues that I initially was not aware of. Through this internship, I gained direct exposure to the working on an international human rights organization. I also had the opportunity to network with several professionals in the legal and non-profit fields at leadership conferences hosted by Google, the French Embassy and Human Rights Watch. I was given the opportunity to draft a report on Guinea’s bauxite mining industry that is due for publication sometime this year. I was also assigned a task to identify locations and numbers of Internally Displaced Person (IDP) camps in Mali following clashes in 2012. Through this internship, I greatly improved upon my research, analytical and critical thinking skills. This summer at Human Rights Watch served as a great avenue to learn about the employed strategies and efforts that are placed in investigations on issues of human rights abuses; and in the exposure of facts that generate extensive media coverage and eventually, changes in policy. It also gave me the opportunity to gain hands-on experience in human rights advocacy field which I plan to pursue as a career, and honed my existent skills while simultaneously acquiring new ones. In addition, this internship helped me build my confidence as I attended various conferences and forums and networked with numerous professionals in the legal field. My summer at Human Rights Watch has helped me guide my professional path and goals. I am certain that I want to work in an organization that focuses more on legislation of policies to protect human rights and eventually go to law school with the hopes of becoming a defense attorney. I would like to thank Jim Wormington, Corinne Dufka, Lauren Seibert, and my coworkers-MJ, Charline and Gen for an enriching summer experience in DC. My name is Duncan Tulimieri and I am a Health, Exercise, and Sports Studies major and Biology minor at Denison University. Over the summer of 2017, I was a strength and conditioning coach intern at Prentiss Hockey Performance. I am currently a junior and plan to graduate in 2019 and go on to a graduate school for Kinesiology after graduation from Denison. I am the alternative captain for the men’s ice hockey team. My internship was a very unique one to say the least. I wasn’t sitting at a desk and looking at a computer and spreadsheets like one imagines an internship would be. I actually did the complete opposite. I was up at the crack of dawn and moving around all day, setting up and breaking down exercises for both professional ice hockey players and the general population. The internship had many great aspects, but my favorite part was getting to know some of the athletes and learn about their views and perspectives about strength and conditioning. I learned that being a strength coach is not only just about being able to work someone out, but also about talking to the person and realizing that you are dealing with a person, not a textbook or skeleton. One of the most rewarding parts of the internship was that I got to see many topics talked about in the classroom, be applied in real life. Some topics that I saw get applied in the gym that were talked about in the classroom were; the stretch shortening cycle, passive insufficiency, isokinetic movements, isotonic movements, isometric movements, etc. It’s one thing to learn about concepts in the classroom and be tested on them, but it’s a whole different setting when you apply them to real live people, and watch how it affects them. I could not have gotten, or done, this internship without the help of my parents, my supervisors, and the generous donor who supplied me with a stipend. I would also like to thank the people at Prentiss Hockey Performance for helping me to expand my mind and think about things in a different way. My name is Emily Walsh, I am a Communications Major with a concentration in Organizational Studies. This summer I had the opportunity to work for an influencer marketing company, #paid. #paid is an influencer marketing company that is based in Toronto, Canada. Recently, they have expanded their offices to New York City. I was fortunate enough to be the second employee ever in the NYC office. Influencer marketing is a form of the marketing world that focuses on social media influencers. These individuals have extreme influence over their followers and brands reach out to them to help market their product in an organic fashion. Influencers are seen as new age celebrities, they have high followings on different social media platforms such as Instagram, Facebook, Twitter and YouTube. Influencer Marketing has grown to be one of the more trusted forms of marketing as most people trust and check their social media channels more frequently than reading magazines. What #paid does for these influencers is provide a middle ground between the brands and the influencers. They have a hybrid solution of technology and managed services that provide a streamlined process to make partnering together easy and effective. Since I was the one of the few people to be in the new NYC office, my internship was not your typical workplace environment. My boss was head of sales in New York City, and we did work together and he taught me many valuable lessons. I was able to attend some of his Sales presentations and Marketing Panels. Most days my main priority was talking over “Slack” which was the main form of communication the company used and to work with the Creative and Marketing Team. Initially, I thought I would be used to help with some unfinished projects and loose ends. However, my role at #paid was far greater than I ever could have expected. My responsibilities this summer ranaged from researching data on different companies, to helping format excels, to creating new proposals and searching our database for the perfect influencers that would fit the campaigns. The variety of campaigns I was able to work on ranged from North Face to Canada Goose to Local Grocery Stores in Canada. My summer at #paid helped me grow in a way I hadn’t known possible yet. It helped me see my strengths in working under pressure and how important communication skills are in person and over the computer. It allowed me to fuel my passion for Marketing and put into perspective what the working world truly is like. I would like to thank Cole Tone the Sales director in NYC for being my mentor, and Bryan Gold and Adam Rivietz the Co-Founders of #paid for giving me the opportunity to grow and learn at the company! My name is Samantha Toshok and I am currently a senior at Denison University pursuing a Major in Psychology and a Concentration in Narrative Non-Fiction Writing. This summer, I worked at the Virginia Quarterly Review, a national literary journal located in Charlottesville, Virginia. There, I worked as an editorial intern, and assisted with the production of the magazine, proofread and edited both solicited and unsolicited manuscript submissions, marketed the publication on social media platforms, and helped run the 2017 VQR Writer’s Conference. Prior to starting this internship with VQR, I knew I had intentions of pursuing a career in writing, however, I was not entirely sure in what type of capacity that would be. This internship taught me a lot about precision and word choice when it came to writing or communicating a message to audience members or our readership base. With the help of my direct supervisors and boss, Allison Wright, the managing editor of VQR, I would not have the opportunity to understand the process that goes behind magazine production and the level of accuracy and precision that goes into editorial work. I have, however, found that I am drawn more to creative roles in the corporate side that involve creating narratives around products, services, or brands. I also would like to incorporate more of my Psychology degree and use that to better understand consumer behavior. Despite my different career aspirations, coming out of this summer experience has given me the opportunity to hone the very skills that I plan on applying to many future creative roles such as market research consultancy or advertisement. This summer I spent two months in Pune, India in an internship that set me on my career path. I’m Ashmita Das, a senior double majoring in Communication and English Literature. Like any other college student, I wasn’t absolutely sure of what I wanted to do after graduation, till I spent the summer working at a digital marketing firm called Xebec E-Media Technologies. I went in with no previous knowledge of the industry and unsure of whether I would thrive there. I quickly realized this is what I wanted to do with my career. I worked on digital marketing strategy for a major tourism company and came up with unique ideas to sell a campaign pitch. I also handled social media content for Aldo, Birkenstock and Call It Spring in the Middle East, all by myself. I was constantly surprised by how much I could take on and accomplish every day. Going from a timid intern who was unsure of herself to handling major accounts alone, I saw my professional growth in front of my eyes. I worked with an amazing team of young professionals who became like my family in an unfamiliar city. From hectic workdays to dinners on the weekends, they made sure I felt like I was one of them. This experience was made even more gratifying by my supervisor, Zeeshanali Ruby, who constantly pushed me to do better and taught me all he could possibly teach me in two months. He was invested in making sure that I got everything I needed and more from this internship. The internship let me work with fashion, which is one of my passions and made me realize how I could utilize my strengths to make a career out of it. It helped me plan my life after graduation and put me on a path to attain a master’s degree in Digital Marketing from Europe. This summer internship was a truly enriching experience that would not have been possible without my amazing colleagues and the all the help I received from the Knowlton Center.